Finding a good bottle of wine from Southern California can be a challenge for those who enjoy the softness of cooler climate wines like Paso Robles, Santa Barbara, Sonoma and Lake County. Our warmer weather produces a different grape for winemakers. So we’ve been visiting with some of the locals to find some interesting regional wines. Today we’ll visit Laguna Canyon Winery, just 1 mile inland from Pacific Coast Highway on Laguna Canyon Road in Laguna Beach . You won’t find any grapevines behind the tasting room. Mostly, you’ll see exotic cars with wild paint jobs and artist workshops populating the industrial space behind the wine tasting room. This winemaker doesn’t grow grape, he sources grape from Northern California, areas including Sonoma Valley, Napa and Lodi wineries. The winemaking space sits directly behind the tasting room, it is a mini version of estate bottled winery production facilities. The owner invited us into the production area and, stepping over some wine transfer lines, we were able to smell the beginnings of a Merlot he was working upon. We have a saying about wine tasting, that you must kiss a lot of ugly frogs before you find your beautiful Prince/Princess. Meaning, the good bottles of wine are always at the end of the flight. They save the best for last. Surprisingly, this was not the case here. 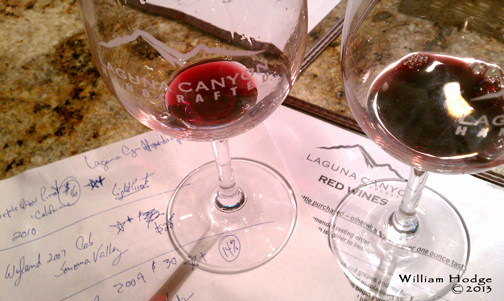 All wines we tasted deserved a ✰+ from both of us. But I do have one complaint. We asked for a paper version of their wine list, because we take notes on it. They had no extra copies to offer. Most tasting rooms are gracious and offer you the paper version pulled from their menu covers. Not so here. Our stand outs were the Petite Sirah (jammy & fruity) and the Malbec (big nose, dry & earthy.) So, we purchased the Petite Sirah, 14% alcohol, for $30. The Wyland Chardonnay and Cabernet are available retail at Total Wine stores, in Florida. Beyond that some local boutique wine stores carry their vintages. You’ll also find their wines in local restaurants and art shows. Keep an eye out for Groupon offers for this winery. The most recent offer was a $40 tasting for two which included a bottle of wine each of Wyland Chardonnay and Cabernet, along with winery glasses. Not a bad deal for a good local wine tasting. Tastes are $2 apiece. You’ll find them at 2133 Laguna Canyon Road, Laguna Beach. This entry was posted in Cabernet Sauvignon, California Wineries - New World Wines, Lodi AVA - Home to 80 Wineries, Petit Sirah, Sonoma, Southern California, The Pleasures of Tasting Wine, Thoughts About Wine - Exploding Ruby Flowers On Your Palette, Uncategorized and tagged bottle, cabernet, california, chardonnay, laguna canyon road, paso, robles, Sauvignon, sonoma, tasting, wine, wine tasting room, winemaker, wineries.